Support this Series by Donating Online to Ruach Israel! Stay connected with our congregation via our website and Facebook page. Be the first to find out about what’s happening next! Experience the Conference On Demand via YouTube! All lectures were captured from a live stream and can now be experienced on YouTube, available for playback to watch at anytime. All five sessions are separate videos on one YouTube playlist. Even if you were not able to attend and be part of an exciting time in November 2017 at Ruach Israel, you can still watch the conference sessions using the link above! A donation is not required but would always be gratefully appreciated! Please share to all who would benefit from the sessions! Opening Lecture, Bilateral Ecclesiology & the History of Messianic Judaism: This lecture will introduce the series by describing the current period of transition in the Messianic Jewish movement, and urging the next generation of leaders to draw creatively upon the wisdom of the past as they address the challenges of the future. That wisdom includes bilateral ecclesiology. This lecture will define bilateral ecclesiology, set its emergence in the context of the history of the Messianic Jewish movement, and suggest that this insight has the potential to provide essential guidance for the future. Bilateral Ecclesiology & the New Jewish Landscape: This lecture will look at some of the dramatic changes that are occurring in the Jewish world, and propose future directions for the Messianic Jewish movement that draw from the wisdom of bilateral ecclesiology and take account of those changes. Bilateral Ecclesiology & the New Christian Landscape: This lecture will look at some of the dramatic changes that are occurring in the Christian world, and propose future directions for the Messianic Jewish movement that draw from the wisdom of bilateral ecclesiology and take account of those changes. Bilateral Ecclesiology & the New Secular Landscape: This lecture will look at some of the dramatic changes that are occurring in secular society, and propose future directions for the Messianic Jewish movement that draw from the wisdom of bilateral ecclesiology and take account of those changes. Bilateral Ecclesiology & the Future of Messianic Judaism: This final session will summarize what has already been presented, and advance the discussion by describing several models of Messianic Jewish life that need further attention and development in the coming decades. Rabbi Mark is a Messianic Jewish scholar who is President Emeritus of the Messianic Jewish Theological Institute. 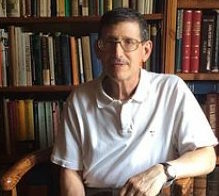 He received his PhD in Near Eastern Studies from the University of Michigan and smicha (ordination) from the Union of Messianic Jewish Congregations in 2001. His most notable work is Postmissionary Messianic Judaism: Redefining Christian Engagement with the Jewish People (2005). He currently serves on the Theology Committee of the UMJC and is Chairperson of Hashiveinu, a forum for advancing theological discussion in the Messianic Jewish movement. Presently, he is the Spiritual Leader of Congregation Zera Avraham in Ann Arbor Michigan. More about Rabbi Mark can be found on his website: www.markkinzer.com.